Western Red Cedar is used in many outdoor applications because of its great durability. iWood sells Western Red Cedar in Planed and Cut to Size forms, as well as pre-moulded or sawn external cladding. A lot of cedar is bought from iWood for making hot tubs. Historically, because Western Red Cedar is so common in its growth areas, it has been used for items from canoes to houses and from instruments to totem poles. Tools made of Western Red Cedar have been found in the Pacific Northwest dating back 8,000 years. Because of the tree’s resistance to rot and infection, house builders would often cut planks straight out of the side of a living tree and it would happily carry on growing. 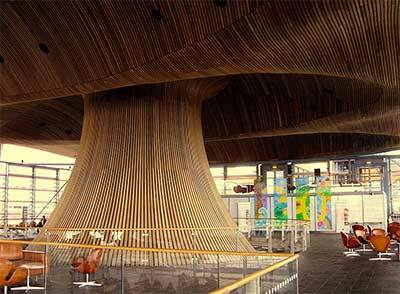 iWood didn't supply the timber for it, but the image to the right shows the Western Red Cedar Oriel and Cowl in the Senedd in Wales.